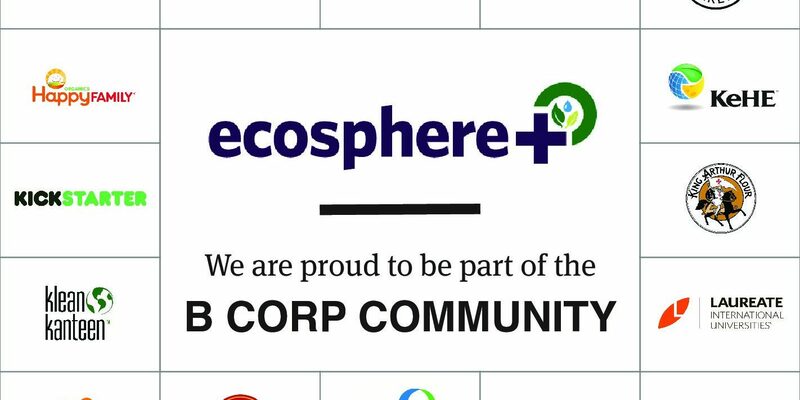 Ecosphere+ is thrilled to announce that we are now a fully certified B Corp! Don’t know what a B Corp is? Well, you’ve come to the right place, as we are very proud to be part of this vibrant and inspiring community of companies who are ‘using business as a force for good’. Environment – including office inputs and outputs. This is a global movement of around 2,700 certified companies, of which about 200 are based in the UK, including some well-loved brands such as Patagonia, Danone, Ben & Jerry’s, Pukka Herbs, Eileen Fisher, Innocent, Method and Ecover, Ella’s Kitchen, Divine Chocolate, just to name a few! Ecosphere+ has been a pending member of the community since our launch just over two years ago. The ‘pending’ status is for brand new companies. Full certification to B Corp requires achieving a minimum score on the rigorous impact assessment which analyses impacts from business operations from the last year. For companies who are under a year old and do not yet have a year’s worth of activity to assess, they can get on the path to full certification and earn the temporary Pending certification. We did this from the beginning of Ecosphere+, and started our assessment as soon as we turned one, as we are committed to being the best company we can be. We used the B Impact Assessment as a best practice guide to help us shape some of our policies and practices from the outset, such as 360 performance reviews, remote working environmental guidelines and supplier policies. Earlier this year, we received word that we’d passed the assessment with a score of 86.8, just around our 2-year birthday. Transparency is a core value of B Corps, which is why you can see the score of all certified companies on their website. You can see our pubic report here to see how we scored. Being part of this community of leaders and business shapers is really important to us, both to work with or supply from and to help develop climate solutions for to further their ambitions to be global leaders in using business as a force for good. We have already worked with a number of B Corps, including Red Inc– a sustainable office supply company – for whom we make their deliveries carbon neutral and who also printed our latest Impact Report;Ben & Jerry’s who we piloted a new point of sale technology and programme at their London flag ship ice cream store; NISOLO– an ethically and eco-made shoe company – who protect trees with each pair of shoes sold; Leap – a sustainable design company – who designed our recently launched Case for Forests booklet and who also including forest protection in their end of year gifting in 2018; and B Lab UK themselves became carbon neutral for their 2018 operations by compensating their impacts using our projects. To learn more about the B Corp movement, see here. You can even use the B Impact Assessment as a free guide to benchmark your company’s sustainability performance, even if you don’t want to go the full way to certification. Contact us to find out about how we can help your business address your climate, environment and social impacts through protecting threatened forests.